San Polo, one of the oldest parts of Venice and also the smallest of the six sestieri, is known for its beautiful palaces. Since 1097, San Polo has been the place to see and be seen in Venice. After all, the San Polo district is steps away from the Rialto and Venice’s main market scene frequented by chefs and locals alike. It’s no surprise, then, that when the noble Coccina family of Bergamo moved to Venice in the 16th century, they commissioned a palace to be built in San Polo right on the Grand Canal. Today that beautiful residence, known as the Palazzo Papadopoli, is the exclusive 24-room Aman Canal Grande. As with most palazzos throughout Italy, ownership of the Palazzo Papadopoli has changed hands many times since the Coccina family called it home. In 1864 it became the seat of the brothers, Count Nicholas and Angel Papadopoli and then passed to the heirs of Papadopoli in 1922, the noble family Arrivabene Valenti Gonzaga. The family still lives there on the top floor and the rest has been rented out to Aman Resorts. Arriving by foot (most guests will arrive by boat transfer from the airport or train station right to the palazzo’s private dock), was like arriving at someone’s grand home. I rang the bell and was buzzed in by way of one – they have two – massive private gardens. With real estate on the Grand Canal at a premium, these oases in the heart of historic San Polo are truly something special. Stepping through the door into the grand reception area, there is no check-in desk or concierge desk of any sort. It truly feels am though we’ve come for a visit at a luxe private palazzo. Aman Canal Grande has just 24 suites and the Palazzo Stanza suites all offer views over the Grand Canal. The staff enthusiastically tells us that the Papadopoli Stanza is the very best room in all of the hotel as the doors are swept open for us. It offers views over both the Grand Canal and the garden. Original Tiepolo frescoes adorn the ceilings in both the bedroom and the bathroom. The stucco is gilded, the radiators are crystal, and a discreet black tassel hangs near the door to be used as a do not disturb sign. Though the bedroom with king size bed and fireplace is inviting, my favorite area of the suite is the bathroom. The large tub just beckons for you to relax in a bubble bath while drinking in the canal views. There is a separate rain shower, double vanities, a dressing table, and a central seating area that really looks perfect for curling up with a good book in the solace of your chamber. Up on the fifth floor, I step up onto the traditional altana – a rooftop terrace with stunning views of the terracotta-colored chimney pots and belfries. It’s a clear day and I can see all the way to the still snow-capped Dolomites. It is seriously one of the best view of Venice I’ve ever seen (and I’ve climbed a few belfries in Venice). It’s a perfect spot for relaxing with a cappuccino in the morning or one of Aman’s signature cocktails at sunset. Aman Canal Grande has two restaurants – unsurprisingly, an Italian restaurant and a Japanese restaurant, which has just opened in the canal-facing garden for the summer only days ago. The Italian menu is served in the opulent red and yellow dining rooms, with canal views of course. Naoki is the creation of Chef Naoki Okumura, chef-owner of the acclaimed Okumura in Kyoto, Japan. He calls his style of cuisine “kaiseki”, a combination of the best French techniques with Japanese artistry. Days later I’m still drooling over the memory of the meal. We started off with soft shell crab and spicy tuna with avocado sushi rolls (€22 each), which were plentiful. It was the best sushi I’ve had in ages, so it’s a good thing we only live a short train ride from Venice (or perhaps that’s a bad thing…). At our server’s recommendation, we also shared the king prawn tempura served with a hot soy dipping sauce and the grilled scampi. 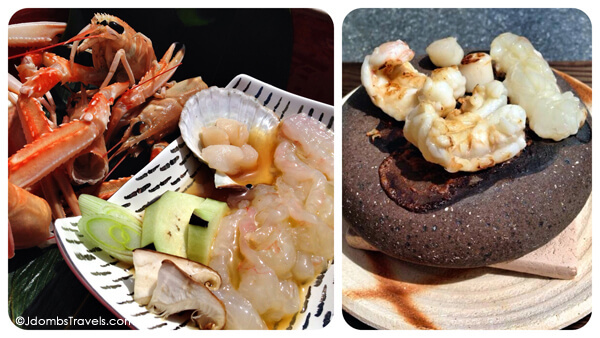 What I particularly loved about the grilled scampi is that you cook it right at the table on a sizzling hot stone. What I didn’t love about the scampi was the portion size, which I felt was a bit small for €38. We could pass up something sweet to curb the saltiness of the Japanese food and I was delighted that my pear and chocolate sorbet was served in an edible chocolate cup. Aman Canal Grande plays down everything hotel-like. In the midst of sheer opulence, the sumptuous palace feels as cozy and welcoming as a private home. With just 24 suites, there are plenty of richly decorated common areas throughout the palazzo to find your own space. And while inside the palazzo, you completely forget the hustle and bustle of Venice’s busy calle happening just beyond. 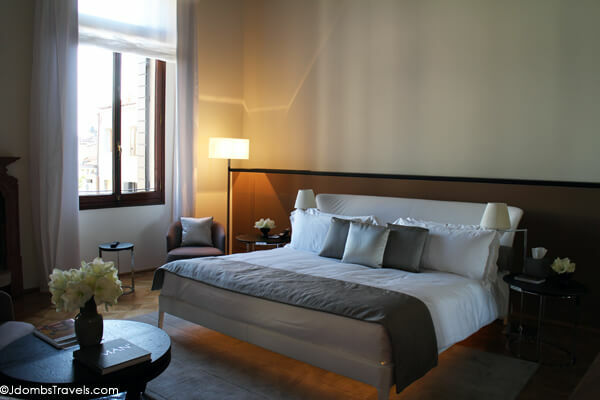 Aman Canal Grande is priced accordingly for a 7 star hotel with rates from €1150 to €3650 per night. 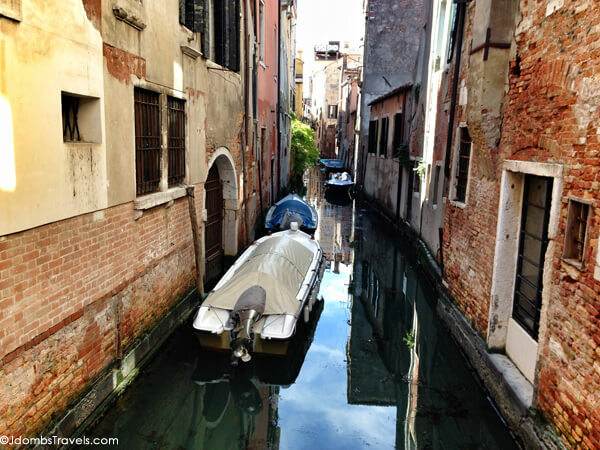 Our visit and lunch was hosted by Aman Canal Grande in order to bring you this story. As always, all opinions are entirely our own. The Tourist! I actually liked the movie, and you are right…very similar! It was Palazzo Pisani Moretta that served as the location for the interior Danieli scenes in the tourist and now that you mention it, it does remind me a bit of it. This particular room had subtle decoration on the walls. The true masterpieces were the ceiling frescoes, which were near impossible to photograph with the room. There are five suites that are very richly decorated more like the common areas though too. I have read this review with a big pleasure. One day, we plan to live a few days in some Venetian Palace. Thank you for the information. Well, Aman Canal Grande would be a fantastic choice. I was just discussing it with a friend about how peaceful it is inside the grounds of the palazzo. You forget that you are in tourist packed Venice with how quiet it is. Looks like a beautiful hotel, and the sushi looks great, too! That sushi was so good, Val! 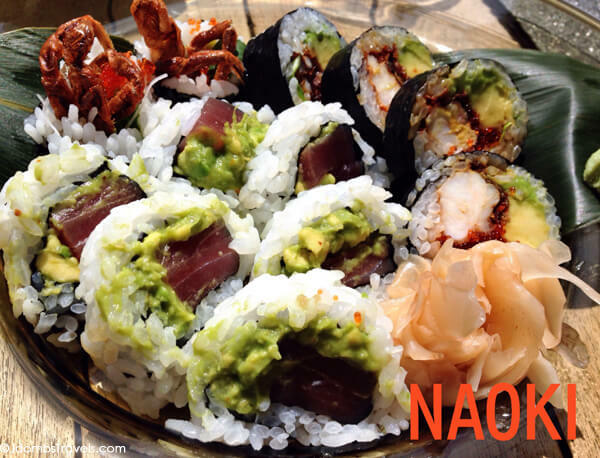 I’m not sure which was my favorite – the soft shell crab or the tuna and avocado – since both were delicious. Although out of the price range of most mortals, it does look like an amazing location and the room looks lovely. For that price I’d hate to leave the hotel and probably wouldn’t. 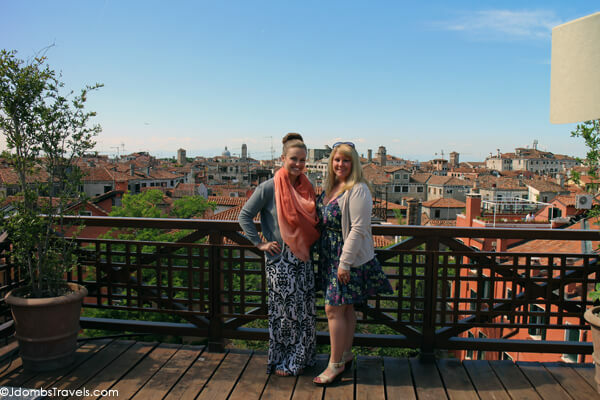 I have yet to go to Venice and was pleased to see the views over the city from one of the outdoor balconies. I think you’d quite like Venice, Leigh. The Dolomites are only about an hour away and offer some world class hiking. As for the hotel, it’s definitely designed for the luxury traveler and was at full capacity on our visit. 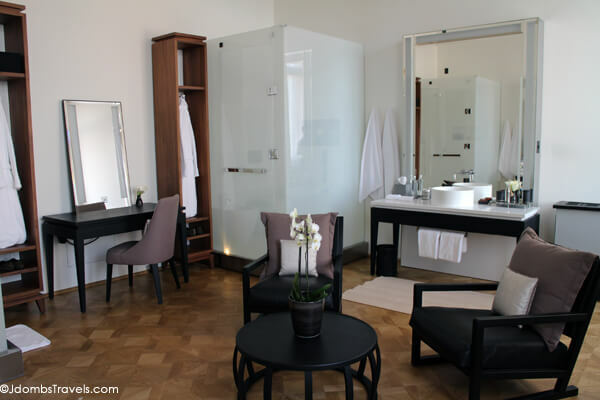 To stay at Aman Canal Grande would definitely make a Venetian holiday extra special. That altana is beautiful (and being from Venice- I have seen a few). I love the location of San Polo- away from the mobs of San Marco and perfect for travelers that want to get to know the real Venice. Do you still live in Venice Elena? We live nearby in Pordenone. 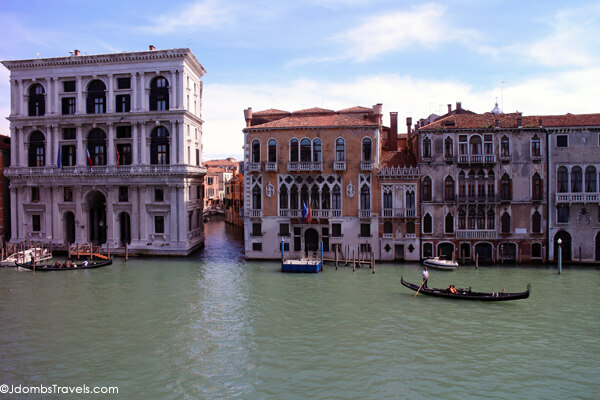 Though the view of the Grand Canal was fantastic, it was that view from the altana that took my breath away. No- sadly. My family is from Venice- (and I was born in Abano- but lived in Modena) and we spent all of my summers in Lido and go back every two years or so. We were there last summer, so sadly this is an off year for us. 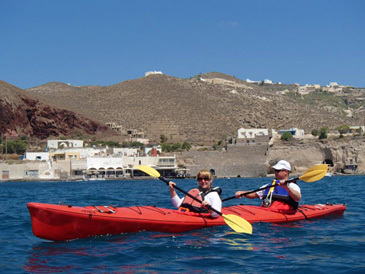 Great to hear of other fantastic experiences with Aman Resorts. This was our first experience with the brand. We’d definitely seek them out in other locations based on our Venice experience. Gorgeous property, I’m sure the service is spectatular. I don’t think I could bring myself to eat Japanese food with all that delicious Italian food around though. 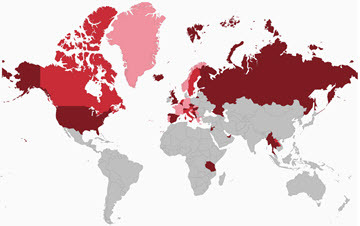 Living in Italy, we get so sick of Italian 24-7. Especially where we live, there is absolutely no variety. So we get really excited when there are other options available. WoW that hotel looks gorgeous, definitely the way to go when visiting Venice. Must have been an amazing experience. The rooms are incredibly spacious for Venice, where everything usually feels small and crowded. It’s a gorgeous property. That’s absolutely gorgeous. I would love to travel the canals. I will live vicariously through your photos! Aw man, I was hoping you were able to stay in it. Next time, tell them that you truly can’t let us know what it’s like unless you stay there and you need 2 – 3 nights minimum 😉 Haha! But seriously, looks beautiful. I wonder how comfortable their beds are. I’ve never stayed in a 7 star, but 5 star + always have the most comfortable beds. With just a handful of rooms and their beautiful location and high level of service, the hotel is understandably at high capacity always. But we enjoyed being invited for lunch and to spend the day at the hotel. And I completely agree, Deb! The only hotel beds that don’t make me cranky are are 5 star hotels. No doubt Aman’s beds would ensure a cloud like environment for a perfect nightmare rest. It certainly does not feel like a hotel by any means. Just a fabulous royal residence you have the honor to be a guest in! When I first saw the picture of the Piano Nobile Lounge, the first thing I thought was the movie then I read Devlin’s comment. So Im right! The place is just ..Wow! And the food , double wow! You’re a lucky girl! 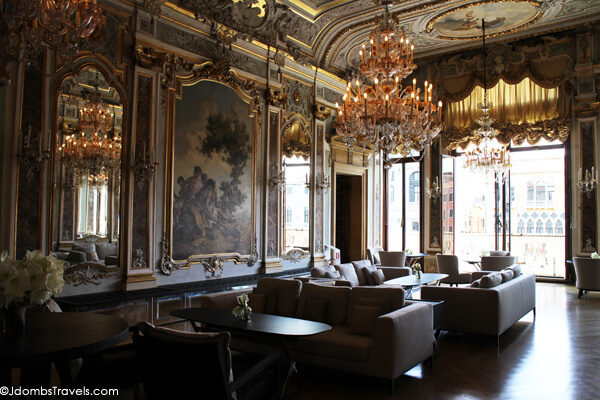 Aman Canal Grande definitely has wow factor. It’s no wonder George Clooney chose it as his wedding reception venue. I would have loved to see it decked out for the wedding of the year!